I've been struggling with fibromyalgia for nearly fourteen years now. It's not a sometimes thing - every single day of my life is dominated by this @#$%^ disease. I hate having to ask for help, but Medicaid doesn't cover my necessary meds and supplements and my housing situation has changed as well. I've made a lot of progress the last year thanks to those who stepped up last time. God willing, I'll be able to continue recovering and be able to return to work within the next year. Most of you know about my health struggles already, but I'll re-post it here for those who don't. For 14 years now, I've struggled to beat a basketful of autoimmune diseases - fibromyalgia, CFIDS, Sjogrens and hypothyroidism. I've never given up and never quit. It's not a sometimes thing - every single day of my life is dominated by this @#$%^ disease. I try to stay positive and not whine about it. On my good days, I prefer to enjoy them, and on my bad days, I just don't talk to anyone at all. Most days are somewhere in between, so substitute hours for days in the previous sentence. And yet, many people close to me don't have any idea what I go through and have gone through. I've lived for years now on $20-30 a month. But some things require more cash than I'm capable of earning. Everything is harder when you're effectively homeless and have no transportation. When you're disabled and can only function limited and unpredictable hours each week, it sometimes seems insurmountable. Most of the energy I have is used up in the struggle just to make it through each day. Everything beyond food in my belly and a sheltered place to sleep has become a luxury. But my medications are a necessity. I need them to function even in the limited capacity I have. I could use other things as well - underwear and socks cost money. I'd like to try and get my car running. I could really use a new pair of shoes, and so on. So, I'm swallowing my pride ad asking once again for your help. If you can spare just $20, it means more to me than you can imagine. When doctors told me there was nothing more they could do to treat my disease, I had to educate myself and try to find a way to overcome. My primary resource was the medical textbook The Metabolic Treatment of Fibromyalgia, by Dr. John Lowe. It was a struggle to read, as you can imagine; doctors seem to speak and write in a foreign language! But, thankfully, he recommends natural alternative treatments. 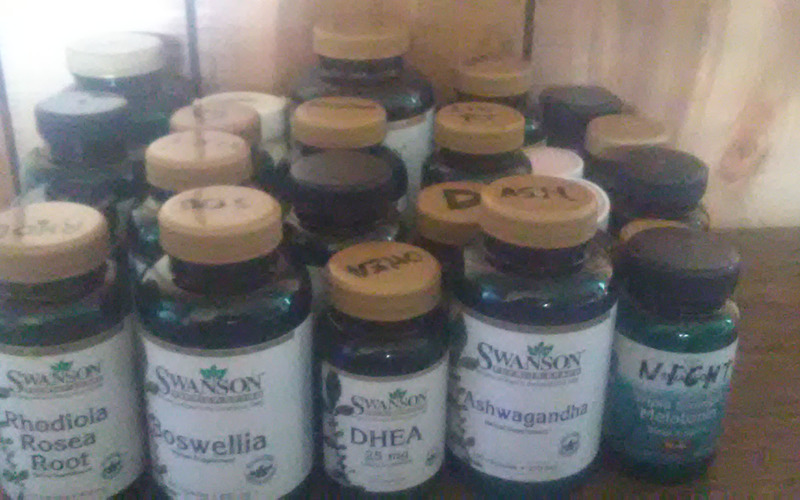 Once I began using those natural supplements, I improved considerably, going from being a virtual invalid to semi-functional. Plus, the treatment is relatively inexpensive. Relatively being the key word - $300 or so per year seems quite inexpensive, unless that's the entire amount you have to live on for that year. My doctor has been great, trying to find ways to improve my health, as well as prescription alternatives to the natural supplements I take (I cringe to even write that) so as to be more 'affordable' aka paid for by Medicaid (Thanks, Obama, as much as you screwed that up, it has helped me tremendously.) Unfortunately, consistent and effective treatment of Fibromyalgia remains elusive. So, I am forced to humble myself and once again ask for your help. Any amount you can give is greatly appreciated. Thank you.